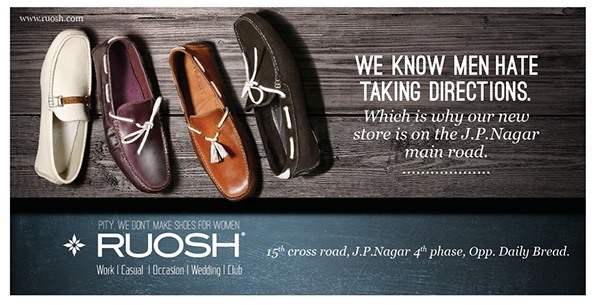 While flipping towards daily newspaper Times of India (TOI) I came across a print ad of newly launched shoe brand called as RUOSH. This brand is the first from the house of Sara Suole Pvt Ltd. This luxury shoe brand is a Bangalore based company and has been into Indian shoe market for almost a decade. It started as a seller (distributor) of luxury shoe brands like ESPRIT, Kenneth Cole, Louis Philippe and few more. Sara Suole Pvt Ltd decided to enter the Indian shoe market with its own brand with a decade of experience behind its back. If you analyze, the company did the right thing by coming up with an in-house brand. Some might feel they are late entrant on the flip side some might feel its right time to enter as the Indian retail scenario is changing rapidly (thanks to eCommerce boom). At present, the brand is being sold via both formats i.e traditional retail outlets as well as online eCommerce shopping portals like Amazon.in , Jabong , Flipkart , etc.